Huber Off to a Fabulous Start at Chinaplas 2017! Chinaplas 2017 opens for Huber Engineered Materials with a special technical presentation discussing the benefits of Huber’s NEW Martoxid® TM thermally conductive fillers and array of halogen-free fire retardant additives for wire and cable and building and construction applications. Here, Thomas Dittmar (right), highlights the halogen-free fire retardant and smoke suppression technology at the well-attended session. 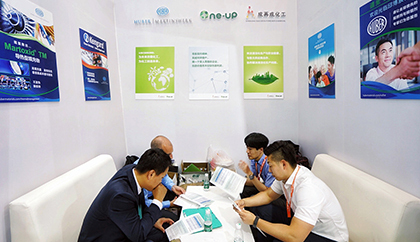 Chinaplas 2017 has just concluded its second day of four in Guangzhou as over 140,000 attendees are expected by week’s end. Huber Engineered Materials has been extremely busy with visitors stopping by Hall 10.3, Booth P05 to learn more about our halogen-free fire retardants and smoke suppressants for plastics and wire and cable applications. An additional highlight at this year’s Chinaplas is the introduction of our NEW Martoxid® TM thermally conductive fillers for themoplastic, elastomer and thermoset compounds. We opened the event Monday morning with a well-attended technical presented hosted by Huber’s Martijn Mies and Thomas Dittmar. Martijn is Research and Development Manager and Thomas is a Certified Technical Specialist with Huber’s Fire Retardant Additives business. Both are based in Bergheim, Germany. The duo spoke in-depth about the new Martoxid TM technology and our specific halogen-free fire retardant additives available for a variety of applications. Chinaplas concludes Friday of this week, so there’s two more days for you to visit Hall 10.3, Booth P05 if you’re in Guangzhou. We cordially invite you to stop by! A number of key customer and distributor meetings have taken place the first two days of Chinaplas 2017. Huber Exhibiting and Presenting Technical Seminar Next Week at ChinaPlas 2017! We’ll Definitely Have the Winning Hand Next Week at the Eastern Coatings Show in Atlantic City!